The P1800 was based on a design exercise by the Swedish-born Pelle Pettersson whilst working at Frua, and was officially unveiled at the January 1960 Brussels motorshow. Entering production a year later, the newcomer's sleek two-door monocoque bodyshell was equipped with independent front suspension, a coil-sprung live rear axle and disc/drum brakes. Powered by a 1,782cc OHV four-cylinder engine (complete with five-bearing crankshaft and twin SU carburettors) allied to a four-speed manual gearbox, the 2+2 seater was capable of over 100mph. 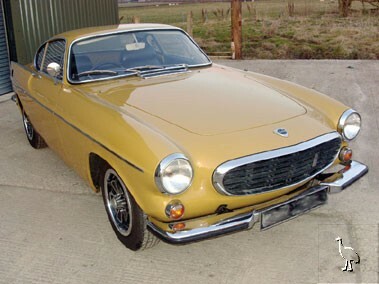 The P1800 was initially manufactured by Jensen Motors in the UK - the bodyshells were produced by Pressed Steel Fisher at Linwood and then shipped by rail to Jensen in West Bromwich. However, assembly was transferred to Sweden in April 1963 due to increasing concerns over fluctuating build quality. The original engine was replaced in 1969 by the 2-litre B20 unit. This was itself upgraded a year later with a revised camshaft and fuel injection. The resulting output was 130bhp - sufficient to power the Volvo to 62mph in 9.5 seconds and on to a shade under 120mph. This facelifted model acquired four wheel disc braking at the same time, plus a revised name to reflect the fuel injection - P1800E. Never a major contender in the racing world, a P1800 did, though, finish second in class at the 1967 Daytona 24-hour race. However, for many the Volvo is best remembered as Roger Moore's steed in the cult TV series 'The Saint', which ran from 1962 until 1969. WNR 290J is a righthand drive P1800E built in 1970 and is finished in Safari yellow complemented by a black interior. The car benefited from an extensive body restoration in 1998. Numerous bills also attest to regular maintenance of a car that has been especially cherished in the last few years. Apparently new, correct, leather covers have recently been fitted to the front seats. The vendor describes the coachwork, paintwork and interior trim as being in 'very good' order and the engine, transmission and electrical equipment as 'good. The Volvo is MOT'd into October. This car could provide the perfect opportunity for anybody who dreamt of being Simon Templar to belatedly indulge their passion. PLEASE NOTE: Since the catalogue went to press we have been contacted by Simon Borrell Esq who used to own 'WNR 290J' about six years ago. He informs us that during his stewardship the engine was treated to a re-bore, new unleaded cylinder head, replacement oil pump, fresh bearings and new camshaft / followers plus its crankshaft oil seal retainers were modified to accept modern lip seals. In addition to sourcing a fresh clutch and 'new old stock' gearbox, Mr Borrell reportedly had the rear brake callipers refurbished using stainless pistons. Recollecting his time with the Volvo he comments that "It really was a first class car, shame I sold it".